Harvard Graduate Students Union kicked off their bargaining session with a Bargainfest in October. The Harvard Graduate Students Union-United Automobile Workers bargaining committee went to their first-ever bargaining session with the University in October bearing an 80-count wish list and cheering optimistic chants. Just a month later, they say those goals will likely be hard-won. The committee wrote in an email to union members on Nov. 6 that their first two bargaining sessions — one in October and one in November — were marked by forceful pushback from Harvard administrators. In particular, the committee wrote the union took issue with University counter-proposals seeking to maintain existing procedures surrounding sexual harassment allegations and to exclude hourly workers from the bargaining unit. 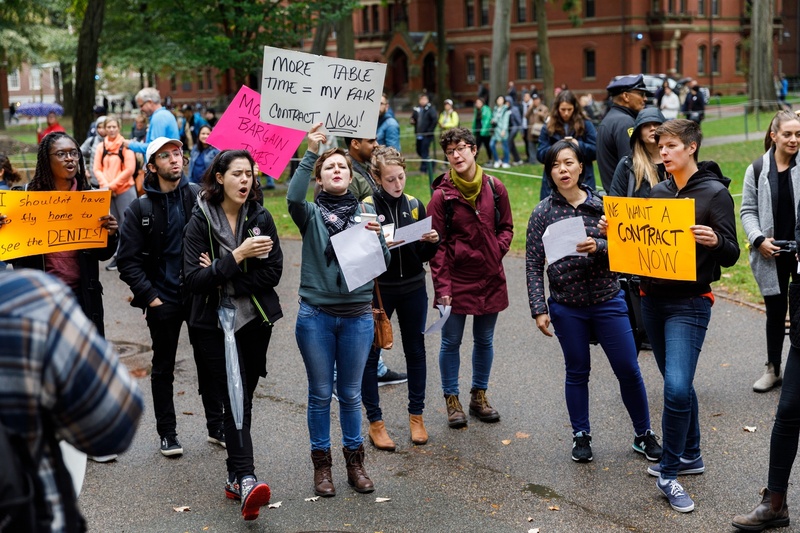 Efforts to change Harvard’s grievance procedures surrounding sexual misconduct allegations have been a central pillar of HGSU-UAW’s contract goals. Before negotiations began, union members said bargaining for these changes would be among their first asks of Harvard — a strategy they have pursued. HGSU-UAW is not alone among graduate unions in pushing for contract provisions related to sexual misconduct. 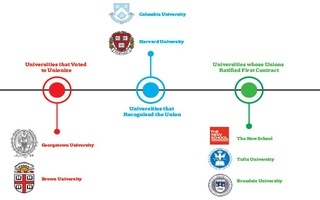 Graduate unions at the University of Connecticut and New York University — both of which HGSU-UAW has cited in the run-up to negotiations — have successfully bargained for reforms in this area. The UConn contract allows union officials to advocate for members who have filed allegations of harassment with the university, and the NYU contract specifies that violations of its nondiscrimination agreement constitute grounds for a formal union grievance. Administrators also disputed HGSU-UAW’s characterization of members’ workloads over the course of negotiations, according to the email from union organizers. To support their proposals, bargaining committee members recounted personal experiences they had asked union members to share with them. 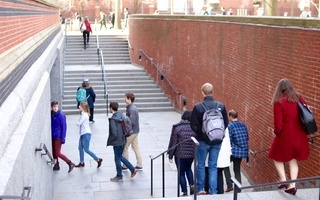 In response to the first two sessions, the bargaining committee also wrote it plans to ask Harvard to schedule longer and more frequent negotiations. Earlier this semester, HGSU-UAW members said they hoped to meet administrators five or six times before winter break. “To reach an agreement in any reasonable time, Harvard needs to demonstrate that it is committed to addressing students’ demands and meet on a more frequent basis,” the email reads. Bargaining committee member Madeleine F. Jennewein wrote in an emailed statement that, after receiving a “thoughtful proposal” from HGSU-UAW, the University proposed an “unacceptable” response. Jennewein wrote it is “no secret” that some students feel “widespread dissatisfaction” with University procedures for responding to sexual misconduct allegations. The union and University have not announced the date of a third bargaining session.